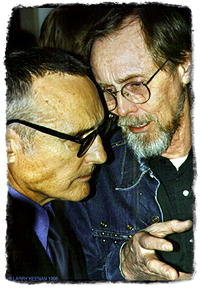 Actor Dennis Hopper and artist Bruce Conner -- both native Kansans -- San Francisco, 1996. Dennis Hopper is from Dodge City, KS, and Bruce Conner is from McPherson and Wichita, KS.
" Dennis Hopper and Bruce Conner are having a discussion at the Paule Anglim Gallery in San Francisco, CA. The event was the opening of Hopper's and Conner's joint show at the California gallery." © 1996, Larry Keenan. Used with permission. Return to the Beats In Kansas or to Kansas Heritage Group. Relate site: WWW-VL: History: United States History. Photograph © 1996, Larry Keenan; page © 2004 George Laughead, maintainer, Beat Literature, ODP. Page posted: 28 July 2004. Updated: 04 July 2007. Hosted at WWW Virtual Library @ www.vlib.us.